I have recently completed a rebuild of my WI14 and I thought I would share it with you guys. I changed out all of the electronics - CTS pots, Orange Drop caps, treble bleed mod on the volumes, new Switchcraft jack and 3 way switch, and new wiring. The pups are DiMarzio PAF Pros. Schaller strap locks. Wilkinson locking tuners. And of course a yellow accent scheme. I even painted the switch tip a matching yellow. Oh, and by the way, it plays great. And loud? Well, the new knobs go all the way to 11! 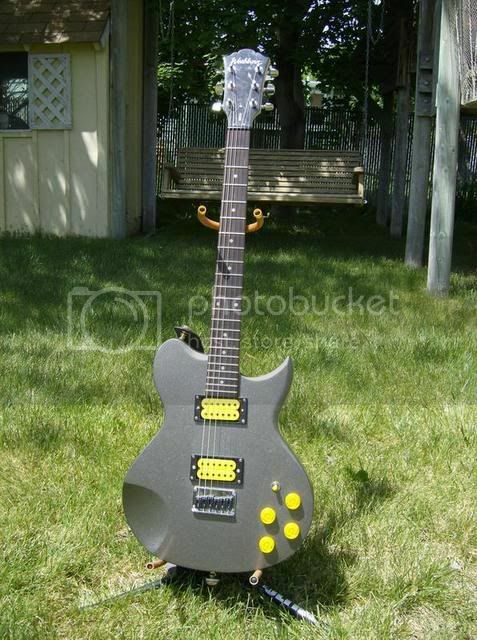 I bought this low end Idol a few years back - it's the metallic grey. Part 1 mods: (a) Changed out the pickups for a Seymour Duncan JB/Jazz set. GREATLY improved the sound with this. (c) Tried a spin-a-split option (Washburn calls it VCC) on the neck Jazz pickup. Turned the bridge tone into a master tone. It was okay, but nothing to write home about. (d) Replaced the tuners with Wilkenson Locking Tuners - another good improvement. Part 2 mods: (a) New pickups - not my original plan, but a deal came my way and I wanted to try them. The JB/Jazz were okay - but I wanted to see if I could get something a bit beefier - then someone offered a good deal on a set of DiMarzio PAF Pros. They're in, but I haven't fired them up yet. (b) A new wiring kit from Acme Guitar Works - CTS 500k pots, Orange Drop caps (.22 in the bridge, .15 in the neck - I read about that somewhere), a volume kit (cap and resister to prevent treble roll off at low volumes), a new 3 way switch, and a new jack - both from Switchcraft. The CTS and Switchcraft parts do not fit into the Idol without modifications. I had to carefully ream out all the holes with a Dremel tool to get them to fit. I finished all the soldering and tested the electronics - I'm getting sound from the pickups. (c) Graph Tech String Savers replacing the saddles. Again a good deal came my way and this is my third set of Graph Techs. I love them. (d) Next I'll put on the strings and give you guys an update. I'm going to change the pickups in my Idol to a pair of DMZ PAF Pros - I thought I might as well rewire everything while I'm at it. I'll most likely go with CTS 500k pots and .22mfd Orange Drop or Hovland caps. But I wanted to know what's in there now and found something unusual. First - two of the pots are completely covered by solder - but I can see some of one tone and one vol pot. They both say Aipha. The tone pot also says A50** the rest is covered by solder. But I assume it is A500 - that is - audio taper 500k. But the volume pot says B5** which if I remember correctly would mean - linear taper 500k. This seems wrong. Does anyone here have any knowledge about what they actually put in these things? General Discussion on Washburn Electric Guitars / Found a surprise inside my OE30! Three washers (two plain, one locking) magnetically attached to the pickup! General Discussion on Washburn Electric Guitars / No Washburn Vs? I'm just venting here. I've been toying with the idea of getting a V guitar. The only Washburn V I can find is the Anarchy WV16. It looks nice, but to tell you the truth, I think the Anarchy graphics would get old after a while, I don't want to buy a guitar that I know I'm going to want to refinish. I've been looking at the Jackson King V, but I would sure like to get a Washburn if I could. I have a blue OE-30. It has a black pickguard. I saw a blue ES335 with a white pickguard and really liked it. I want one. The problem: I'm having trouble find one anywhere. A lot of LP pickguards but few 335 pickguards out there - and they're all black! Has anyone here already been down this road? Can you direct me? I've changed out the pickups for a Seymour Duncan JB/Jazz set and love the sound. I now want to put in some locking tuners. I am considering Wilkinson locking tuners. Here's the question: I could go with chrome and stick with the current scheme - or go with black, then change out the hardtail bridge for a black bridge. The cost is not really an issue, but I'm not really unhappy with the bridge on this guitar now - so in a way it seems wrong to change it out. Anyone here have any bad experiences with the lower end Washburn hardtail bridges? Also, GF bridge has 3 mounting screws - it looks like the Idol bridge has 5. Is this an issue? Any input at all would be appreciated. General Discussion on Washburn Electric Guitars / Where's Boogie Street? So what happened to the Boogie Street thread? Did the trolls get him? I just bought a OE30 (nice guitar by the way) and it has Vinci strings. They proudly display their product with a special tag. I've read past posts about the OE30 - and they all say, first thing, change the strings. Yet, when I was just going through the the Boogie Street site, I noticed the same tag on their Fallen Idol - and I'm thinking that as much attention to detail that Eric seems to take with his guitars - if Vinvi was all that bad, wouldn't he change them out? But my question: Anyone here use Vinci's regularly? Any useful comments about these strings? I would rather not change them out - they seem to be doing okay - and I want to assess the guitar as shipped if possible. They did take a while to stretch them out - but they seem to be stabalizing now. I haven't gigged yet with this guitar yet, and I don't want any surprises. I know a few people here have bought the OE30... what case do you use? Musician's Friend recommends the Washburn GC71 case - but two reviewers at Music123 say the case is complete junk. I hate to spend $100 for a junk case to protect a $150 guitar. There has to be a better case out there. I just want to thank you and Washburn for being on this forum - it's really great to have someone here that really knows the products. Now, if only you could get Washburn to include some kind of instructions with their guitars - even if it's only a cheap photocopy of a single sheet. The most common question I see here is Which knob does what? ...which could be so easily cleared up with a small effort on Washburn's part. Just because I posted a few pre-upgrade questions here and you guys were helpful - I thought I would let you know how it went. I essentially doubled the value of my W-14 Idol by installing two Seymour Duncan pickups - SH-4 JB in the bridge and SH-2 Jazz in the neck. The sound is amazing and this guitar is fun to play again. It now sounds as good as it feels - which is pretty good. The only close call was the distance from the neck pickup to the volume pot is just a fraction of an inch less than the length of the leads. I was a littel worried there because it is a very tight space to work in. For some reason the pickup leads come out the far side of the pickup from the control bay - and it threads through the neck pickup slot. But it made it and everything sounds good. I also didn't have quite enough room for the tabs on the Jazz pickup. So I put a small cutting bit in my Dremel tool and routed out a little space for the tab. I was able to do this without cutting into the surface finish (in other words, I undercut the surface) - I didn't want to take a chance of ruining the finish. Oh - one other thing - the back plate has four small wood screws holding it in place - one of the screws is only half in the wood (the routing took too much wood) so eventually this part (the screw) will fall out - but I don't think that is critical. I just put two new Seymour Duncan pickups in my WI14 - a JB in the bridge and a Jazz in the neck. With the stock pickups I just left the tone controls on 10 and that worked. But with these new pickups, I wanted to try to trim the tone a bit - and I noticed that if I turn the Tone down to 1, the volume drops completely out. Is that supposed to happen? I thought it would just cut out high frequencies, not all frequencies. Could it be that I need different values for the capacitors to match the new pickups? If so, does anyone know what value I should be using? General Discussion on Washburn Electric Guitars / What is "Idol"? I guess this a really dumb question that everyone else probably knows... but what was Washburn thinking about when they named the series Idol? What is the history behind this name? I've had people ask me - and I don't have a clue. I recently purchased a WI14. The reasons: the overall comfort of the body and neck - and the sound (and the price). I put a set of D'Addario strings on it and tuned the saddles as well as I could. (1) I'm having trouble keeping the G string in tune. 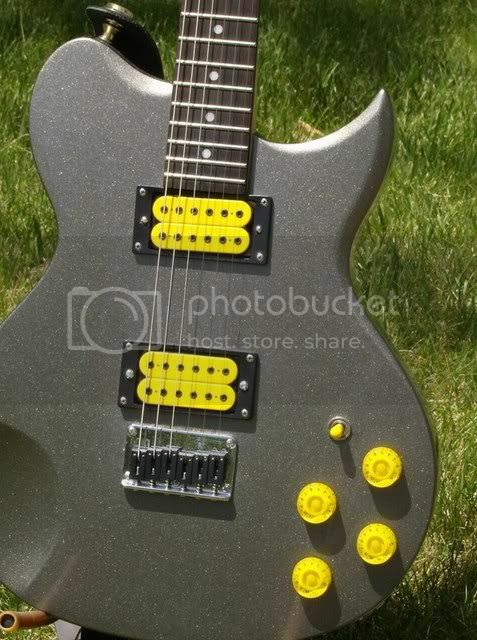 Is this a common problem with the tuners used on this model? Is it something that can be fixed - or should look into getting new tuners? (2) I've generally been happy with the pickups - but the last time I played I was getting a resonating howl (almost feedback) on low B, whenever I played that note. It was probably a combination of the space and the guitar. I tried playing my Strat in the same space and didn't have that problem. I know this is a low end guitar and I am not dissappointed with it. I expected that I would have to make upgrades to bring up the quality - I was just hoping to get some preliminary direction before I jump into it.